Having a good adjustable wrench (sometimes referred to as a crescent wrench – although that’s actually a specific brand of adjustable wrench) in your tool kit, can save the day when nothing else will do. The adjustable jaws allow you to grip bolts that that are no longer suitable for fixed-size wrenches, and quick jobs can be completed even faster when one wrench is able to take the place of several different wrenches. To select the best adjustable wrench for your needs, look for one that’s made with industrial grade alloy, comfortable to grip, and easy to adjust. Other common traits that pros find useful include a hole in the handle end for easy storage, and clearly marked scales to help you set specific nut sizes without resorting to trial and error. 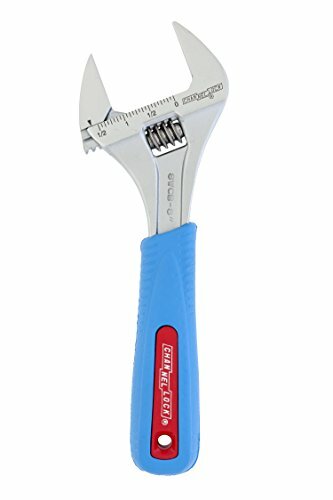 Leading the pack as the best adjustable wrench for the money is the Channellock WideAzz. It measures only 8 inches in total length (also available in a 6 inch version), but uses a unique design that allows it to function as well as a 12 inch model. The secret is in the way the jaws are manufactured, allowing them to open as much as 1-1/2 inches, an astonishing width for an 8 inch wrench. The jaws are also longer than you’d expect, which gives you more gripping power without rounding fasteners, and yet remain viable for compact places where larger, heavier wrenches would not work. The tool is clearly marked with both SAE and metric sizes, and the 4-thread knurl is easy to adjust while locking the jaws firmly at the desired setting. Constructed out of chrome vanadium steel, it will hold up over time and has the ability to resist abrasion, oxidation, and corrosion. 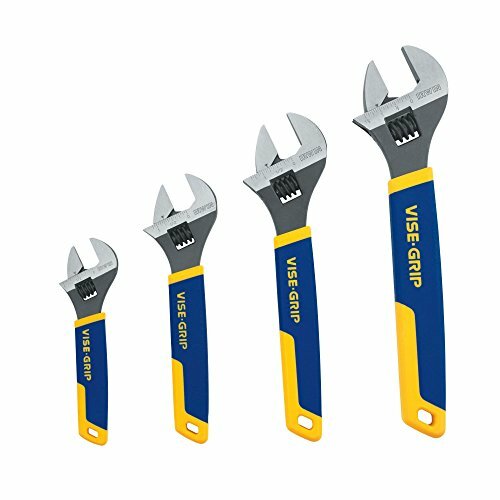 There is not much to complain about with the 8WCB WideAzz Adjustable Wrench, except that the hanger hole is too small to fit many shop hangers, and the rubber grip is subject to scraping and tearing in rough conditions. On the other hand, the rubber grip conceals an ordinary adjustable wrench handle with an extra large hanger hole, so once the grip begins to fray it can be removed without affecting the usability of the wrench and improving your storage options at the same time. 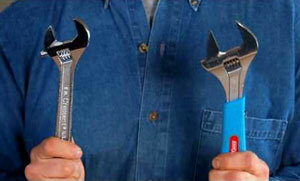 Sometimes, the best adjustable wrench is actually a set of wrenches in different sizes. This Irwin set is perfect for many jobs, and features handle lengths of 6, 8, 10, and 12 inches, respectively. That means you have a wrench small enough to fit into tight spaces, and others capable of opening to larger sizes and permitting you to apply as much torque as necessary to loosen bolts that you thought would never turn again. Made of chrome vanadium alloy, these Irwins include a hanging hole for rack storage, but come with a carrying tray for increased portability. They are marked in both metric and SAE sizes which mean you can set the jaws to dozens of sizes with the ball of your thumb. Compared to a cheaply made wrenches of this type, there is almost no “wiggle” in jaws once they are set, and that means fewer rounded heads and more dependable tightening. There isn’t much to complain about with this set, and the biggest problem, the storage tray, shouldn’t even cause a blink. The tray is an added convenience, and works well in light duty situations, but it will not stand up to rough handling. Most will have a dedicated spot in a tool chest drawer for these. For the serious user, the biggest concern is probably the rubberized grips, because they will wear and split over time. The grips are sturdy enough to last indefinitely for light use, and proper care and maintenance will keep them in good shape for even the most experienced users. And if those grips do eventually split and come off, the metal handle underneath will still provide you with an ergonomic grip that will not slow you down. If something does go wrong with this set of adjustable wrenches, it carries a full lifetime factory warranty, so you can trade in a broken or non-functional wrench for one in good working condition. Made of forged alloy steel, the Stanley adjustable wrench is designed to allow opening the jaws extra wide, accommodating nut sizes that are too big for some combination wrench sets to tackle. Stanley products come with a limited lifetime warranty, and are great for use in many industries, including plumbing, automotive, or as a universal tool for the kitchen drawer. The handle is designed to prevent the dual material grip from slipping, and materials used mean years of wear without worrying about the grip falling apart. On the negative side, there is more movement in the jaws than is preferable, which could result in rounding of stuck bolts if the wrench is not snugged tightly to them before removal. The easy solution for this is to tighten the jaws with them already placed over the nut or bolt, ensuring a tighter grip and easier removal. I have no experience with the Channelock but love my Irwin Tools wrenches. They’re so much smoother than the Craftsman wrenches they replaced.